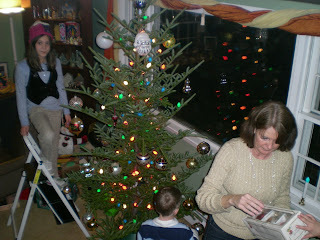 Nana and Papa's Blog: Decorating and getting the tree for this year. 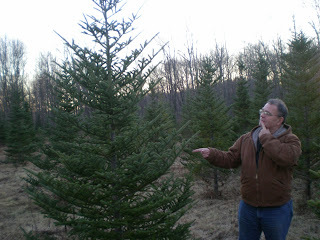 This is the tree we liked right? I think it will be just right but it might be a little tall for our 7 ft ceiling. The branches look sturdy enough to hold all of the big balls that we have. 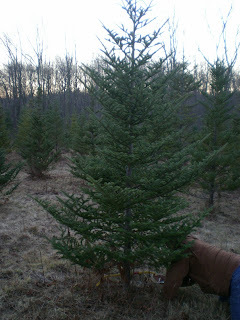 Jim cutting down our tree from a tree farm just up the street from where we live. Of course, he knows all about cutting down trees. Me pulling the tree out to the car while Jim takes the pictures:) not really I just held it so that it looked like I was helping while Jim actually did all of the work. 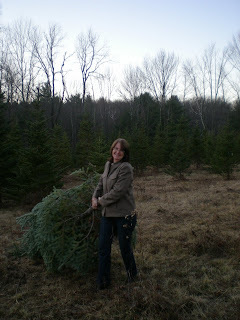 Bringing the tree home. We got a new car and I am so glad that it is a SUV. 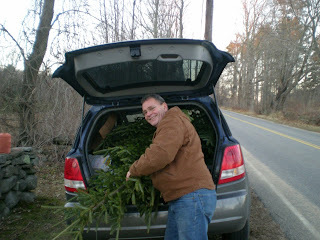 It wasn't large enough for our tree, so we drove with the tree hanging out the back. 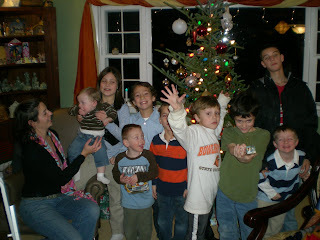 All of the grandkids were so excited to help do the decorating of the tree. 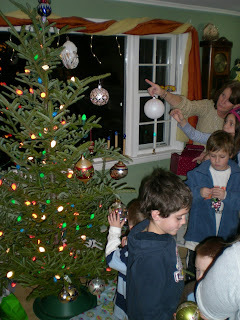 It was really a great night and made the whole Christmas time come alive for us. Abby on the stool to reach the high branches. I thought this picture was so cute of her. Laura holding Carter and talking to Dillon. If you look close to the table it is full of Jolly Jolly Treats. Everyone could not believe how they could have anything that their hearts desired. Everyone having fun those not decorating the tree were playing scrabble or just talking, but eating no matter what the other activity was. Lucas, and Beau really liked the branch right in front all of their bulbs needed to be placed right there. 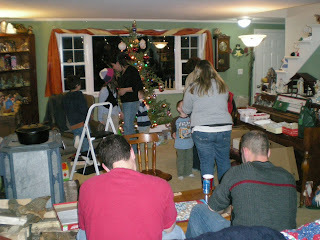 This is a picture of everyone that helped decorate our tree. 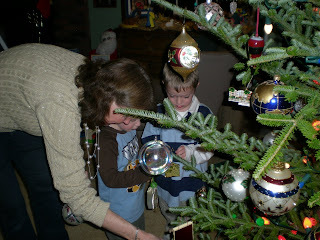 After decorating the tree and eating treats we gave each one of the grandchildren their Christmas gifts. But before they could open them we wanted a happy picture of them all. So this is what we got. 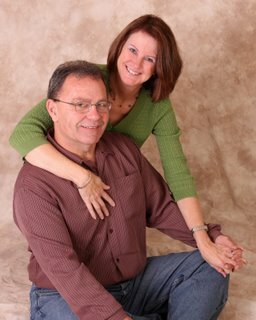 I am not sure if there are smiles or grimaces. 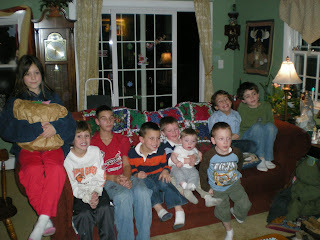 The children for those of you that don't know them are Abby, Matt, Dillon, Tyler, Lucas holding Carter, Beau, Mason and Ryan. We had a great time and hope more of the family can be here next year. That sure looks like it was a lot of fun! Maybe someday we'll be able to celebrate together. I really love that fancy pants quilt on the back of your couch! Oh and we got your Christmas card today and we just love the picture of you guys on the pile of wood. Wow, looks like alot of fun. I am sure you had a wonderful time with everyone there. Is there any snow yet in your area? We hope you have a very Merry Christmas. That looks like a great time! 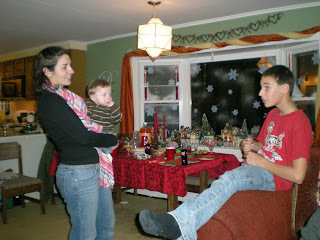 It's so nice that you were able to have such a special time with the family....Merry Christmas!!! We got snow that very night and then this past week we got another 2 feet along with a ice storm. More on the way.